CAA is proud to launch CAA Conversations, our newest initiative for fostering academic discussions about art and its purpose through conversations with diverse scholars and practitioners from our community. Every month, executive director Hunter O’Hanian will interview a notable scholar or artist who is making or has made progressive change in his or her field, with the goal to not only learn more about their craft, but to understand the artist or scholar behind it. 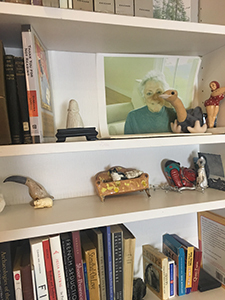 Our first interview in this series is with renowned feminist art historian Linda Nochlin, a long time CAA member and author of the pioneering essay “Why Have There Been No Great Women Artists?” We caught up with Linda at her home on the Upper West Side, where art and inspiring works lined every wall of her apartment. Read the full conversation below (or click the video!) to hear Linda recount the early beginnings of her career, her thoughts on feminism then and now, her advice to young scholars, and a sneak preview of her upcoming book, Misère. A friend…left me Off Our Backs… I stayed up all night reading and I was a feminist the next day. Hunter O’Hanian: Hello, my name is Hunter O’Hanian, and I’m the Director of the College Art Association. I’m here today with Linda Nochlin. Hello Linda. Hunter O’Hanian: How are you? Hunter O’Hanian: You’ve been a member of CAA for a long time. It’s great to have this opportunity to chat with you. Let’s talk a little bit about your background. I know you grew up here in New York, in Brooklyn. You earned degrees from Vassar, Colombia, and NYU. You taught at Colombia, Vassar, Yale. You’ve won many awards from CAA. Most recently you won the 2006 Distinguished Lifetime Achievement Award for writing in art. I know you’ve won a Guggenheim Fellowship. I know you’re a fellow at the American Academy of Arts and Sciences. You’ve got an honorary doctorate from Harvard. A lot of it’s really been about what you’ve been doing as far as thinking about, writing about, teaching about art. What brought you to art? Linda Nochlin: I was always interested. When I was a little kid, I liked to paint and draw. I was very much encouraged to paint and draw both by mother and by my school. Being in New York, I had all these museums. There were a lot of other people who were interested in art that were around me, that were my friends. It seemed sort of natural to go to museums. I enrolled myself when I was 12 in the class for talented children at the Brooklyn Museum. A very interesting place. Hunter O’Hanian: You enrolled yourself you said? Linda Nochlin: I was always interested in art, music, dance. I loved to dance. The arts. Hunter O’Hanian: Apart from your writing, have you been drawing and making work through your adult life as well? Linda Nochlin: No, I quit. Hunter O’Hanian: How come you quit? Linda Nochlin: Well, I don’t know. I just got interested in writing about it rather than making it. Hunter O’Hanian: You have a very long history of publishing. There’s certainly a lot of work that you’ve done with Realism and Courbet. What attracted you to that particular period and that particular genre? Linda Nochlin: Probably it was political I think. It was during the McCarthy period that I came to maturity. I went to the Institute. I really wanted to work on something that was anti-McCarthy. That was left. I was a person of the left and Courbet was the ideal subject in that. Hunter O’Hanian: Tell me about what you remember of the McCarthy era and what was going on at the time and how artists and writers were dealt with. Linda Nochlin: It really was a very oppressive period for people in intellectual and artistic pursuits. Even if they didn’t come and get you, that was always a threat lying over. I remember I began my Frick talk with a long quotation from Karl Marx. People were dumbfounded. I remember my teacher said, “Linda, you’re so brazen.” It was scary times. Hunter O’Hanian: Watching the news today, do you see any similarities? Linda Nochlin: No. I think it’s a different thing now. It’s scary in a different way, but you can say what you want. Unless you’re in government. I think it is a different take. It’s not good and it’s not pleasant, but I think it’s different. Hunter O’Hanian: I noticed…. I’ve read that you said you were introduced to feminism in the late 1960s. You were probably in your 30s at that time. You wrote that you became a feminist virtually overnight. Tell me about that. Linda Nochlin: I had been in Italy in ‘68, ‘69. I came home and a friend came with all these publications and said, “Do you know about feminism”? It was called the women’s movement. I said, “No.” She said, “Read this.” She left me Off Our Backs and rather the somewhat crude broadsheets of the early feminist movement. I stayed up all night reading and I was a feminist the next day. Certainly I always had been to some degree, but I could see now I could become formally as part of an organization, as part of a movement. Yes, I was a feminist. Hunter O’Hanian: Do you see the movement alive today? Linda Nochlin: Mm-hmm [affirmative] yes. But, of course, a lot of people I know happen to be feminists. I don’t know how alive it is otherwise. I think it still is. Hunter O’Hanian: It’s interesting. I meet a lot of male feminists, too, which back in the beginning of the movement…. Linda Nochlin: It would be unheard of. Hunter O’Hanian: It would be unheard of for a man to say he was a feminist. Now there’s many of us who are actually happy to say that. Linda Nochlin: You think of the Women’s March after the inauguration this year. It was enormous. Enormous. Not every one of those people might be a self-pronounced feminist, but they’re all feminists in the sense that they gathered together to show that they believed in something and were against other things. Hunter O’Hanian: Of course there’s the essay “Why Have There Been No Great Women Artists?” that you wrote in 1971. I think ARTnews published that? Hunter O’Hanian: First of all, tell me about the title. How did you end up with that title? Why have there been no great women artists? 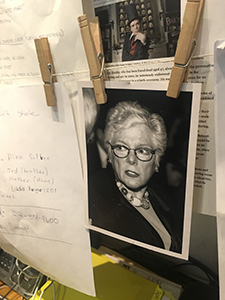 Linda Nochlin: I was at a Vassar graduation the year before and I think … I can’t remember who it was. He had a gallery. He was a well known gallerist. He said, “Linda, I would love to show women in my gallery, but why are there no great women artists?” I started really thinking about it and one thought followed another. It almost wrote itself. It seemed all so hitched together, so logical. Hunter O’Hanian: You address the question in the beginning of the essay about how many great artists there are regardless of their gender, the fact of what actually makes a great artist. Talk a little bit about that. Linda Nochlin: I refuse to say it’s something inborn, a golden nugget I would say, but artistic greatness, artistic production depends so much on time, place, situation, etc. It was no accident that up through the Renaissance, even the 18th century that artists came in families. Father artists, mother artists. You think of the Bach, Johann Sebastian Bach family, family practice. What advice would I have for [young scholars]? Be very, very smart. Write a lot. Have a strong opinion. Just don’t be a little library worm. Linda Nochlin: Well that says what I mean. It always takes place within a context, within a setting, certain training, certain standards. What might be considered great art in one period might not be in others. It’s interesting. There’s a certain agreement in the Renaissance. They knew it was Raphael Michelangelo, etc., very little question. Hunter O’Hanian: You also write here, “the fact of the matter is that there have been no supremely great women artists as far as we know.” I’m happy you added that in, “as far as we know,” although there have been many interesting and very good ones who remain insufficiently investigated or appreciated. Linda Nochlin: I think that’s been corrected to a certain extent today. Hunter O’Hanian: Tell me about the ones who have been discovered or investigated. Linda Nochlin: I suppose Artemisia Gentileschi would be a primary one. Who else? Hunter O’Hanian: What about women artists in the latter part of the 20th century or beginning part of the 21st century? Linda Nochlin: I think women artists have definitely caught up as leaders, as being the interesting ones making art and so on. I’m thinking of somebody like Joan Jonas, for example. I’m thinking of somebody like Louise Bourgeois. Hunter O’Hanian: I was just going to ask you about Louise. Linda Nochlin: The list itself is so long. I’m not saying they’re all Michelangelo, but I’m personally not a Michelangelo person. They’re really interesting and dynamic and have changed the way we look at art, which I think is important. Hunter O’Hanian: I guess it’s in part because society has allowed them to some degree to be able to do that. Linda Nochlin: Yes, of course. They had to fight for it, too. Hunter O’Hanian: Of course. One last quote that I thought was interesting. There’s so much of this essay. I hadn’t read it for years. It’s just so dense. It so wonderful. Linda Nochlin: It is. I tried to squeeze a lot in. Linda Nochlin: It’s sort of hard. Say in terms of color, nobody demands that black people love and adore and cater to white people. It’s only gender that does that. It’s very confusing if on the one hand there is somebody you love, live with, etc., yet who is part of a group or caste that is really denying you equality and denying you self-expression. It’s confusing to put it mildly. Hunter O’Hanian: As we said, we have made progress…. Linda Nochlin: I think so. Hunter O’Hanian: But how much progress to do you think that we’ve made? How tough do you think it is for a young woman, 30 years old, starting out today? Linda Nochlin: I think it’s undeniably better. The conditions are better for a woman succeeding, and a lot of the major artists now certainly are women, but there’s still a boys’ club feeling about certain types of art and certain types of artists. I think you know equality has gone so far and no further maybe. Hunter O’Hanian: It’s interesting when you think about it in the sense that we think women have had the right to vote for 100 years, but still they don’t get paid the same wage. It’s been 135 years since the Emancipation Proclamation has been signed. Linda Nochlin: No, it isn’t just done by words or by the progress of a few superstars either. Hunter O’Hanian: Switching gears, but also on this one a little bit, obviously you’ve been involved in the academy and artistry for many, many years. What is your sense about the future for people graduating out of a master’s programs or PhD programs and getting jobs in higher education today? What do you think about that? Linda Nochlin: I think it’s a difficult market as far as I can see. Although there are now galleries and museums throughout the country. It’s not just a question of the east coast and the west coast and Chicago. I think there is a sort of spreading, or a spread of art which allows for some jobs, but being an artist is tough no matter how you take it. I think it’s getting ahead, finding a gallery, getting a proper amount of publicity, making sure you show. It’s hard. Hunter O’Hanian: What about for scholars, for those getting their PhD about being able to move their careers along? What advice would you have for them? Linda Nochlin: What advice would I have for them? Be very, very smart. Write a lot. Have strong opinions. Just don’t be a little library worm. Hunter O’Hanian: It seems your strong opinions have done you well for your career. Linda Nochlin: I wouldn’t know how to not have them if you know what I mean. That’s what I’m about is my opinions. You have to know something. Frankly I know a great deal. There are very good…. I was a very good student, very good. I worked very hard. I really took pains and energy with my research, not just opinions. They have to be based on something. Linda Nochlin: I’m sure there are. Hunter O’Hanian: It’s so interesting how we develop those opinions based upon what we believe at a given time. Linda Nochlin: Oddly enough I’ve remained more or less consistent. I’ve added some artists in, subtracted some, but the ones that I like are still the ones that I’m interested in. At least many of the issues that I was committed to, I’m still committed to. Hunter O’Hanian: What are you working on now? Linda Nochlin: I’ve just finished a large book called Misère about the representation about misery in the second half of the 19th century in France and England. Linda Nochlin: That’s at the publisher right now. Hunter O’Hanian: When should we expect to see it? *Update: Misère is slated for release after Spring 2018. Hunter O’Hanian: Are you excited about it? Linda Nochlin: Yeah, I am. I laughingly said to my editor, “Are you going to be able to sell a book called Misère?” He said, “Misère by Linda Nochlin, yes.” It was fascinating, really interesting. It pulls together a lot of things I’ve been interested in all along. It’s both new territory, but based on elements that I’ve been interested in for a long time. Hunter O’Hanian: Any nuggets that you want to give away from that that come to mind? Linda Nochlin: Let me think. There’s been relatively little in investigation of the representation of the poor and oppressed. Middle class Impressionism, etc., upper class before that, religious high-minded themes, battles, just the everyday lives of the poor and “uninteresting,” so to speak, not much setting. Hunter O’Hanian: It’s interesting because that seems like a very timely topic for us. Linda Nochlin: Exactly I thought of that too. Linda Nochlin: Absolutely. It was certainly true in the 19th century, early 20th. I think it’s an interesting book. I hope other people find it interesting. Hunter O’Hanian: I look forward to seeing it. Thank you so much for allowing us here in your home. It was great to chat with you about these things. Hunter O’Hanian: I look forward to seeing you at another CAA event soon I hope. Linda Nochlin: I hope so. Linda Nochlin: I would love to. Thank you.